Suggested Retail Price: $16.95 - Our Price $14.75 -- You Save 13%! 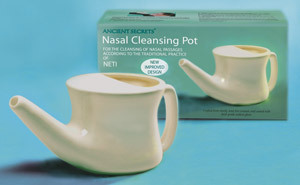 Crafted from sturdy, lead-free ceramic and coated with food-grade sealant glaze.Ancient Secrets® Nasal Cleansing Pot is the ideal answer for cleansing nasal passages. You need only follow the simple directions inside to prepare the saline solution used to rinse through your nostrils. This gentle and effective technique of nasal irrigation is widely recommended by health practitioners worldwide as a wonderful way to improve your overall feeling of well-being and maintain radiant, vibrant health. Many people practice Neti on a daily basis to keep their sinuses clean and improve their ability to breathe freely. Most find it a soothing and pleasant practice once they try it. If you are one of the many people who find that your nasal passages are blocked as a result of the effects of pollution, dust, pollen and other irritants, you may find this simple cleansing technique of invaluable benefit to you. Learn more about how to use the Netipot here.